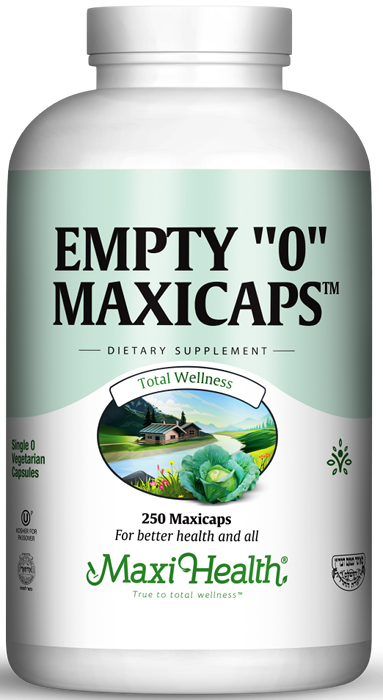 With Empty “0” Maxicaps™ by Maxi Health you no longer have to swallow an animal derived gelatin capsule. You can have the same kosher vegetarian capsules that you depend on from Maxi Health to use on other products that you use. Empty “0” Maxicaps™ are available in 250 or 1000 count. Get yours today! Other Ingredients: This product contains no animal products, soy, wheat, gluten, corn, salt, milk, sugar, yeast, artificial flavors, colorings, or preservatives.